In the last two weeks or so I couldn't figure out what kept digging these large holes in my lawn almost big enough for a mole to fit down, and mounding up quite a pile of soil. I flattened them out a few times, the heavy rains washed them out a couple times, and then today I was nearly run over by what seemed to be the largest wasp I had ever seen heading from once again a new hole in my back yard. Concerned about what nearly seemed to take my head off, while sounding like a prop plane going by I booked it into the house and started doing a little research, and so my story continues. Not entirely trusting the whole "It will not bother you" thing I put long pants on etc., grabbed the camera and tape measure, and cautiously went hunting. Surprisingly it didn't even make the Cicada Killer flinch when I lifted up the crab grass which was half covering her to take some photos. I watched her for 20 minuets or so while she was starting a new hole before she flew off into the woods, and yes I gave her the right of way without any questions leaving the new hole alone. 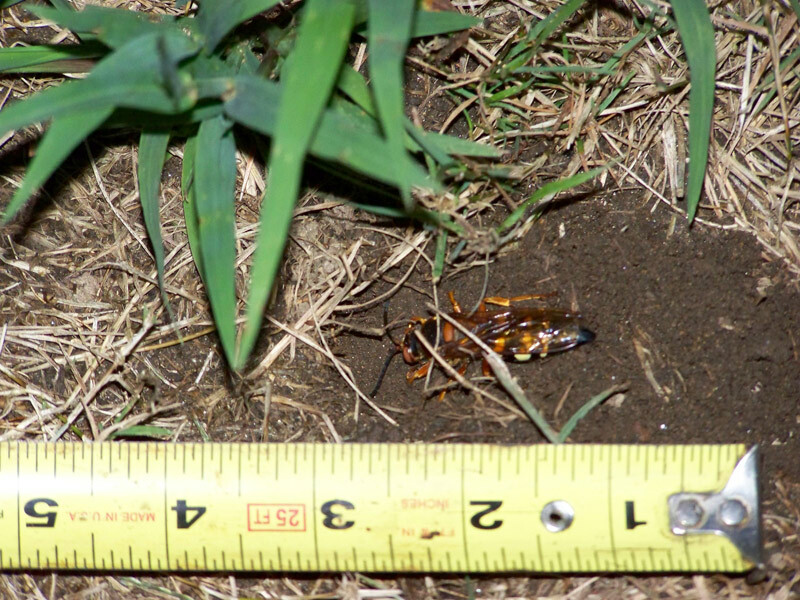 Yes, the life of a cicada killer wasp is always about, creating, cleaning and maintaining their burrow entrances. While they may have one entrance, underground there can be multiple chambers each containing a paralyzed cicada and one egg. Given the rains recently it will be interesting to see if you will have more cicada killers next year.